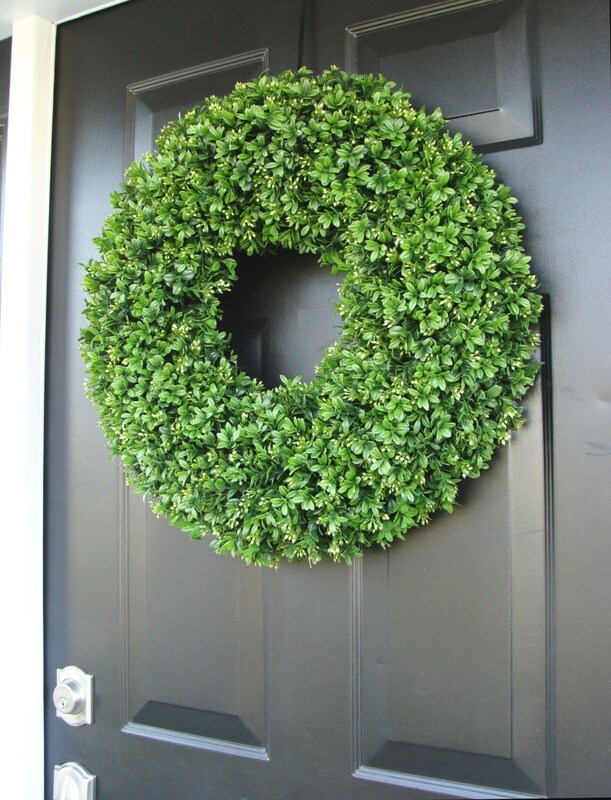 This is no ordinary artificial boxwood wreath! 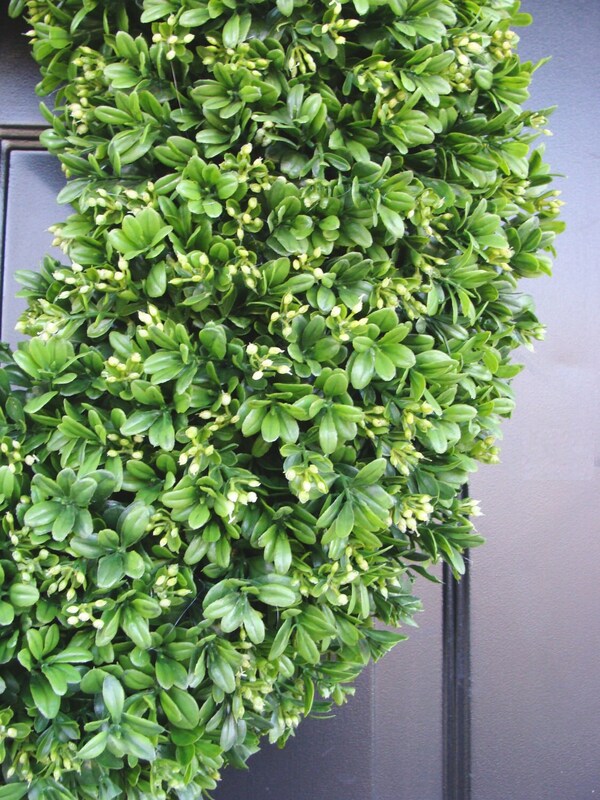 I use the most realistic seeded faux boxwood (not available in retail stores), and cut it into individual pieces. This is time consuming, but I've found that if I also hand place each individual piece instead of large bushes or garland, it allows me to create a very full wreath. Each wreath is trimmed by hand to finish and make it perfectly round. Even the sides of the wreath are covered so the grapevine wreath is not visible at any angle. 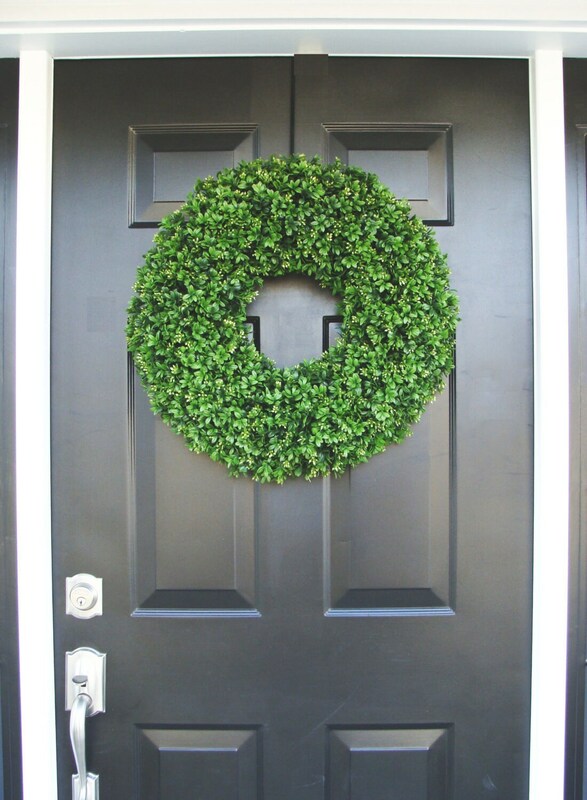 This wreath is very durable being made of plastic thus it can last against any weather condition. If you order two wreaths for double doors, extra material and time will be spent creating two matching wreaths that will make a stunning display on your doors. 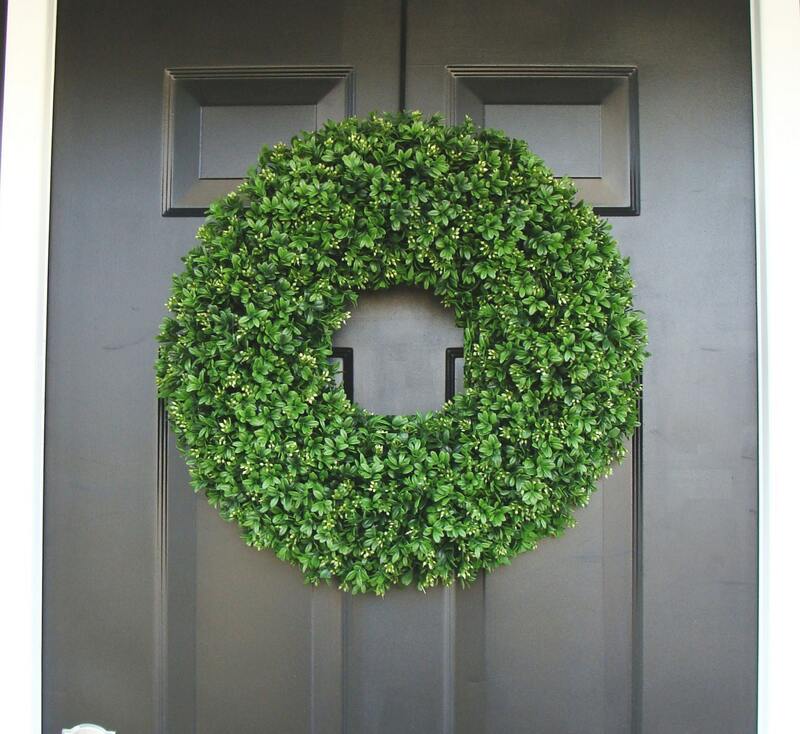 This boxwood wreath measures 22 inches in diameter and 4-5 inches deep. My best selling wreath for a reason! 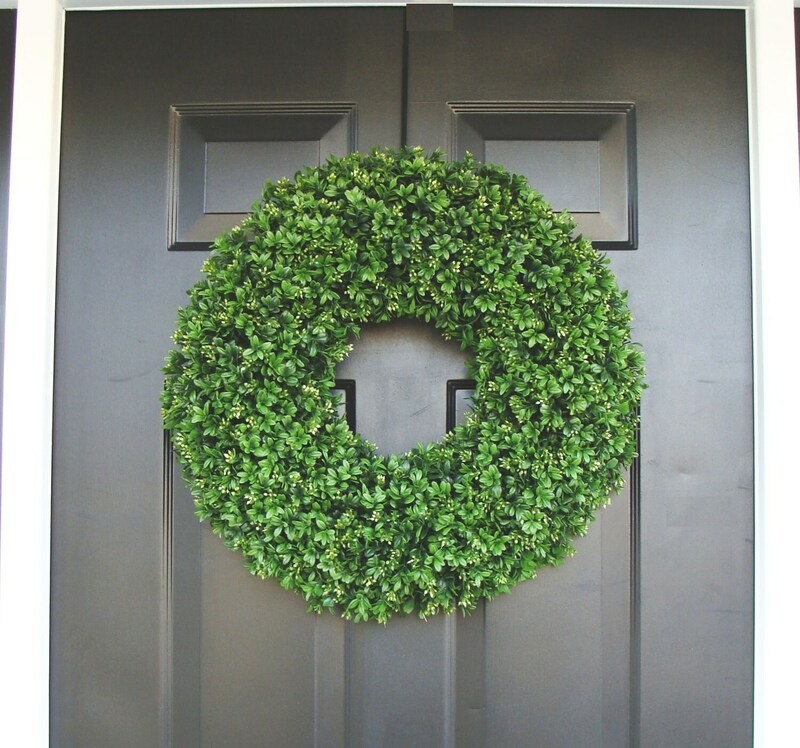 Excluding November, take 10% off your entire order of three or more boxwood wreaths in any size. Great for Weddings, Christmas window decorations, indoor staircases, doors and more! Discounted shipping is also available. Check out my shop (www.elegantwreath.etsy.com) for many other beautiful, quality, handmade wreaths! Any wreath will make a great gift for a loved one or friend so you can always get two and save on shipping or have your gift shipped directly. Custom wreaths are always available so just convo me for options. Wreaths are always shipped via insured UPS service. I love my customers and always strive to provide a quality wreath for a great price! 2nd wreath purchase. Love them. They are beautiful all season long and last a long time! I am very satisfied with my wreaths. They were packaged with care and ready to hang upon opening. They match my shrubs beautifully. Gorgeous wreath! Dense, well crafted and it looks so real that I kept touching to make sure it wasn’t. This baby is a keeper and I’m sure it will hold up nicely for a long, long time. Well done, Elegant Wreath. Well done.